Elite Airways LLC today announced new nonstop flights between Asheville Regional Airport (AVL) and Vero Beach Regional Airport (VRB) in Florida. The new flights, scheduled on Thursdays and Sundays between VRB and AVL will begin on May 25. Early-bird fares start at $179 each way and tickets are now on sale at 877-393-2510 and EliteAirways.com. Elite Airways operates a fleet of Bombardier CRJ-200 and CRJ-700 jet airliners known for comfort and efficiency, and maintains an impeccable safety record. Passengers receive free onboard snacks and beverages, first checked bag up to 50lbs, and no ticketing change fees* (see website for details). Asheville is located within North Carolina’s Blue Ridge Mountains and is known for a vibrant arts scene, national parks and hiking trails, and historic architecture. Vero Beach offers luxury beachfront living and resorts, world-class golf, dining, shopping, fine arts and cultural attractions. “Nonstop jet service to Asheville is a unique addition at VRB, and one that has been highly sought after by passengers who would rather take a nonstop flight versus a ten hour drive. The airport is pleased to see new markets and travel opportunities open up to the area, and we thank Elite Airways for expanding its service at Vero Beach Regional Airport,” said Airport Executive Director, Eric Menger. Elite Airways LLC was founded in 2006 by airline veterans with the goal to provide passengers a better travel experience with nonstop flights, competitive prices and exceptional service. Elite Airways is a U.S. Part 121 Air Carrier and provides charter and scheduled service throughout the U.S., Canada, Mexico, Caribbean, and South America. The airline’s routes connect underserved communities with popular destinations that include New York City/Newark, Portland ME, Asheville NC, Orlando-Melbourne, Sarasota-Bradenton, and Vero Beach FL, and the island of Bimini in the Bahamas. Headquartered in Portland Maine, Elite Airways’ maintenance operations center is located in Melbourne on Florida’s Space Coast. All scheduled flights are sold and operated by Elite Airways LLC, and available for purchase at www.eliteairways.com or by calling 877-393-2510. *Starting fare for a one way ticket. **For Elite Airways flights, the first checked bag and carry-on will be free, $50.00 for a second checked bag, and $75.00 for the third checked bag per person. Each checked bag weighing between 51 and 70 pounds will be assessed a fee of $25 in addition to the checked bag fee. Each checked bag weighing between 71 and 100 pounds will be assessed a fee of $100. Visit EliteAirways.com for more details on our standard baggage service fee schedule. Dates of the advertised flights are subject to change in accordance with regulatory requirements. See the TSA website for a list of prohibited items. (Asheville, N.C.) The newest show at the Asheville Regional Airport Art Gallery opens to the public today. 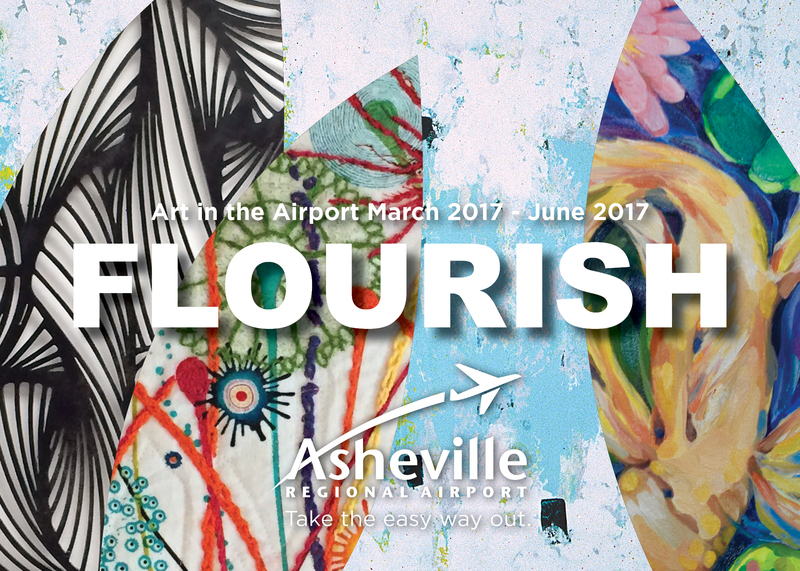 Flourish showcases fine art from four local artists in a variety of mediums.The exhibit is on display now through June 2017. Noticed in the exhibit is acrylic brush work from Michelle Baker, hangings by fiber artist Karen-Eve Bayne, organic metal structures by Mark Olivari, and oils on canvases by Mari Lou Solares. Aptly suited to its name, Flourish lends itself to the welcoming of a new season in the Appalachian Mountains, by highlighting flourishing shapes, forms, and colors. The new exhibit tells a visual story through the arrangement of pliable fibers, rigid metal structures, and strategic brush strokes. Flight crews will often tell you that the aircraft is pressurized for your comfort. While this is reassuring to hear, have you ever wondered what it actually means? What is cabin pressurization and why is it necessary? While people can adapt to high altitudes, climbing and descending as quickly as an aircraft does would be extremely uncomfortable. The higher the altitude, the less oxygen there is in the air and the lower the overall air pressure is. If flights were not pressurized, passengers would be at risk of various physiological aliments. Because of this, federal regulations require that all commercial flights over 8,000 feet be pressurized. So how does it work? Aircraft are pressurized by pumping cooled and humidified air into the aircraft’s cabin during flight. This flow of air into the cabin is constant. Depending on the aircraft, this air can be bleed air (air generated by the engines), fresh air from outside or a mixture of both. The pressurization system is designed to slowly raise and lower the cabin altitude as a flight climbs and descends, to allow as gentle a transition as possible for passengers. When your flight is zipping along at 40,000 feet, the pressure in the cabin will be similar to the pressure at 5,000 or 6,000 feet in elevation. This is a comfortable elevation for the human body, but is still not the same as being on the ground. Essentially, being in a pressurized cabin is more like standing on a small mountain than being on the ground at sea level, or even at Asheville’s elevation of just over 2,000 feet. Most of the physiological quirks that some people experience when flying, like jet lag, are the result of the cabin altitude. A depressurization event (when a pressurized aircraft loses cabin pressure for any reason) is extremely unlikely, but flight crews are trained extensively on how to handle them. In the event of a depressurization, oxygen masks will deploy for every passenger. Oxygen mask demonstrations are always a part of the flight attendant’s safety briefing, and if you’re a frequent flier, you could probably run the demonstration yourself after having seen it so many times. Oxygen masks are designed to deploy if the cabin altitude exceeds 14,000 feet for any reason. A little-known fact about oxygen masks is that there is typically an extra mask in every row of seats on a plane. This means an airplane with three seats on each side of the aisle will have eight masks in that row. These extra masks are for those traveling with a lap child (an infant in their lap), and is also why airlines have a restriction on the number of lap children that can be in any given row. The number one priority in aviation is always safety, so you can be sure there are rules and regulations in place to govern safety around oxygen. For example, there must be enough oxygen on board to allow passengers to continue to breathe comfortably until the pilots can descend below 14,000 feet; there must be at least two hours’ worth of oxygen on board for each member of the flight crew; and all commercial aircraft must be able to descend from their cruising altitude to 10,000 feet in ten minutes. While we’re on the subject, we may as well point out that the aircraft is pressurized from the cockpit to where the tail starts to narrow, and that includes the cargo area of the aircraft, so no need to worry about your furry friends traveling in cargo below – they’re enjoying the comfort of the pressurized aircraft, too! Asheville, N.C. – Asheville Regional Airport (AVL) is reporting the highest number of annual passengers in its 56-year history, with enplanements up 5.6% (414,606) and deplanements up 4.5% (412,042), for a total of 826,648 passengers flying in and out of the airport in 2016. This is a five percent increase over the previous record year, set in 2015, and sustains AVL as the fourth largest commercial service airport in North Carolina. All four airlines at AVL – American, Allegiant, Delta and United – saw annual growth in passengers. The largest growth in enplanements by percentage was experienced by Allegiant (12.5%) and United (8.5%), due to additional routes and increased frequencies to existing routes. Specifically, Allegiant added less-than-daily non-stop service to three new destinations in 2016: Jacksonville, Fla. (summer seasonal); Washington, D.C. via Baltimore/ Washington International (seasonal); and New York City via Newark Liberty International. United increased flights and frequency of service to Chicago during peak travel times. American and Delta both experienced growth, as well. In response to recent growth trends, the airport is constructing a new five-story parking garage, slated for completion later this year. The most recent economic impact study conducted by the North Carolina Department of Transportation’s Division of Aviation showed that AVL contributes more than half a billion dollars annually to the local economy, and generates more than 1,700 jobs. This economic impact will continue to grow as the airport grows. We’ve got some serious air warriors out there – travelers we see every Monday, and welcome home at the end of each week. You’re working hard around the globe, and banking some serious mileage! Some business travelers fly less frequently, so we may not know you by name (yet) – but we sure would like to. We believe there are excellent benefits to designating Asheville Regional Airport as your airport of choice for your business travel, and here are the “top ten” on our list! From mailing, faxing and printing services, recharge stations throughout the airport, and a quiet business center with private cubicle desks – we know you may need to take care of a few things before you board the plane. With numerous parking options – including a lot across the street with 24/7 shuttle service directly to and from the front door of the terminal, you can step from your car and be in the terminal in a matter of minutes. AVL is served by three legacy airlines that have excellent products designed just for business travelers. Learn more about business services: American | Delta | United. Of particular note, flights from AVL often have dual-class (first-class or business-class) service offered. AVL is designed to provide a relaxing, easy experience before and after you board your plane. Enjoy a quiet corner in a rocking chair, or hang out at the bar overlooking the runway in the Blue Ridge Tavern where there are always local brews on tap. You may want to wander through the Art Gallery where works by local artists are displayed, or if you’re lucky – you’ll be in the terminal during one of the “Music on the Fly” pop-up concerts by local musicians, sponsored by Ashvegas.com. Yes, we advise all travelers to arrive two hours before their flights. That’s just prudent traveling. However, our TSA security lines are typically short … and when they do get long, the process is efficient. And if you’re a TSA Pre-check customer, you can enjoy expedited screening at AVL. While there is not a dedicated Pre-check screening line, you won’t have to remove your shoes, belts or jackets before screening. The courteous airline, TSA and restaurant staff provide excellent customer service. We often hear from frequent business travelers that they love being greeted by name – that this small gesture makes them feel at home. That’s our goal, because you ARE at home. AVL is your hometown airport, and we’re proud of the service offered. The presence of a vibrant airport significantly contributes to the economy. Because AVL is here, there are 1,700 jobs in our community, and the economic impact to the region is more than half a billion dollars annually. So, we always ask travelers to “check AVL first” for all of their air travel needs High utilization leads to a stronger airport. And guess what? Travelers ARE flying from AVL – we’ve experienced record-setting years of passenger growth. Thank you. We hope to welcome you back to the airport again soon! In 2013, AVL was named the “best connected” regional airport in America by MIT’s International Center for Air Transportation. Among airports our size, in communities like ours, AVL offers frequent daily connectivity on three legacy airlines via major international hubs (American, Delta and United). Additionally, AVL has point-to-point non-stop service to some key east coast leisure destinations on Allegiant. Reason #1 to Fly4Biz from AVL: When you fly home, you’re home. Business travel is necessary, sometimes exciting (sometimes not), and can be exhausting. When you’re done with the work at hand, we know you start thinking about home. You want to be there. Relaxing in your chair. Hiking on your favorite trail on the Parkway. Hanging out at your favorite brewery on the South Slope in Asheville, or just sleeping in your own bed. So, when you fly AVL for your business trips – the ease works in reverse. When you land, you see the mountains around you and sigh. HOME. You walk off the plane – grab your bag, and in moments, you are to your car. Maybe you stop along Airport Road to grab some groceries, or perhaps you get a text to meet your husband for dinner at Biltmore Park (you can meet there in ten minutes). SIGH. That’s the best. Welcome home. 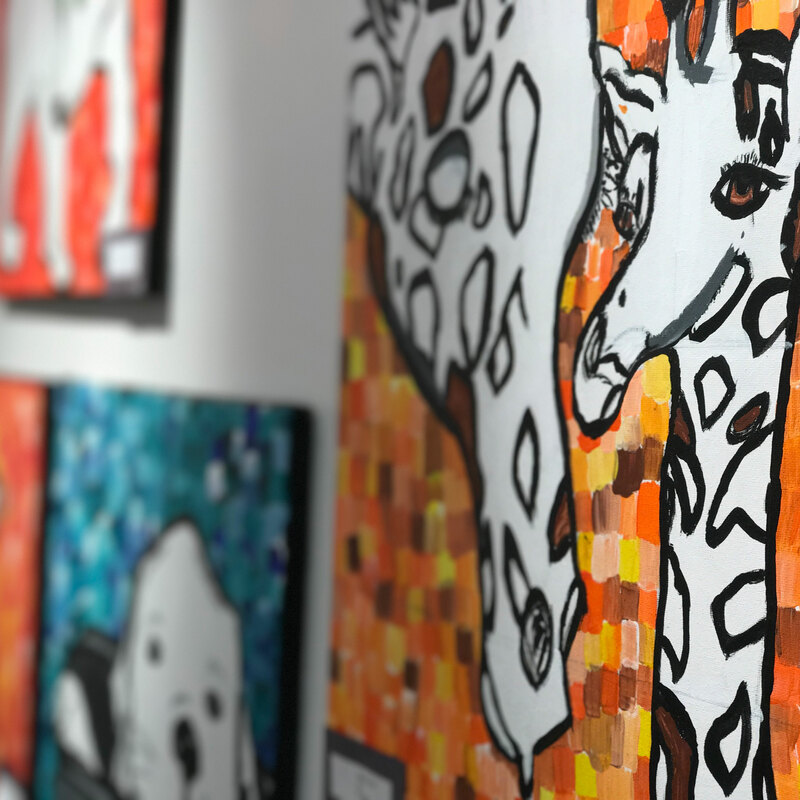 The variety of pieces range from colorfully imaginative drawings and collage pieces by kindergarten and first grade students to detailed paintings from high school seniors. The pieces were carefully selected by the art teachers from participating schools. 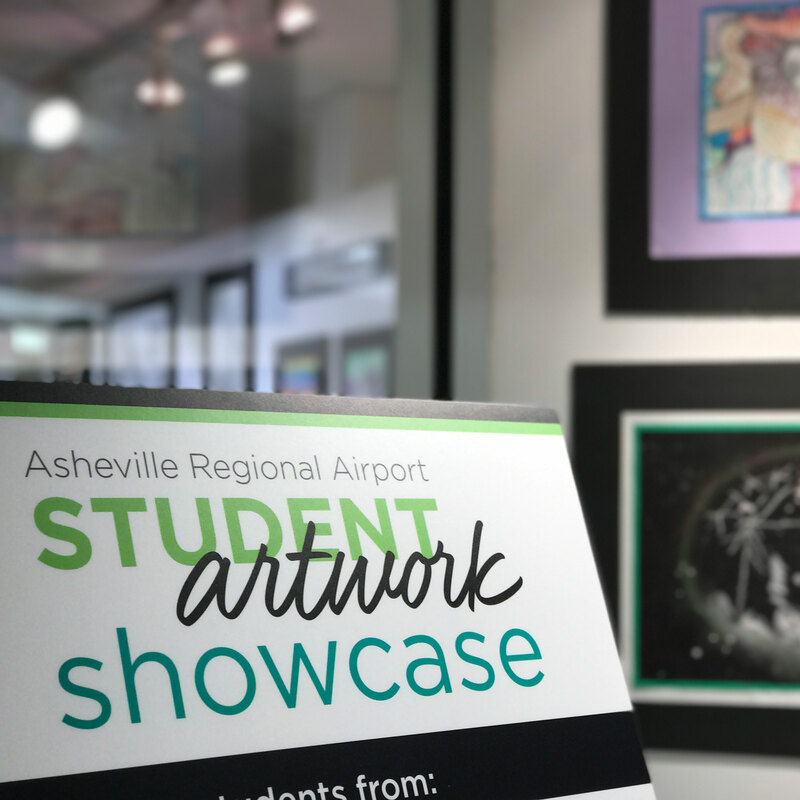 Asheville Regional Airport's Art in the Airport program is pleased to feature an annual Student Artwork Showcase in its art gallery, highlighting the creativity of students across the region. 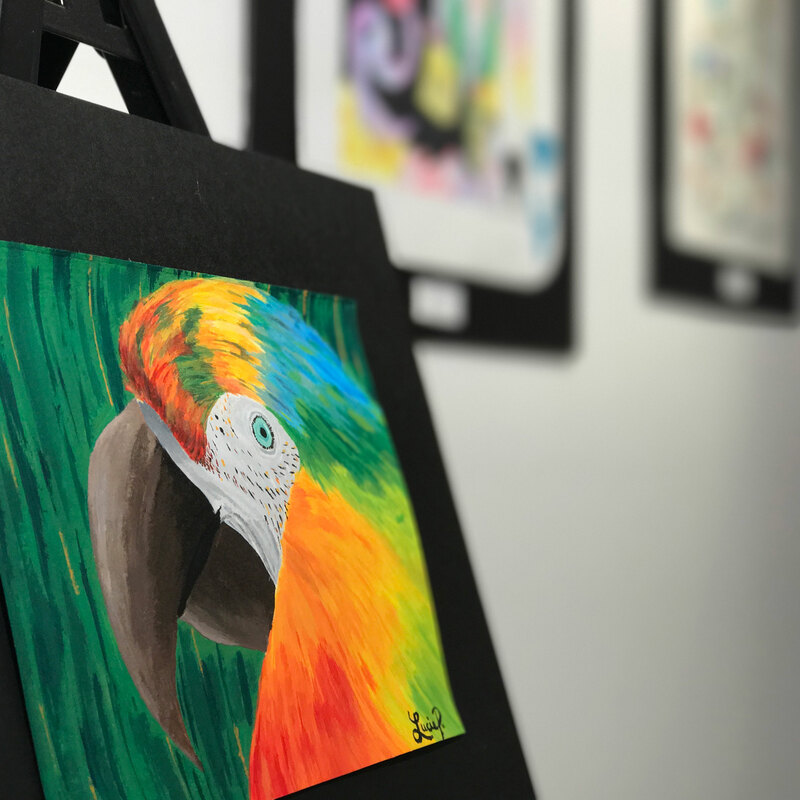 If your school would like to participate in the next Student Artwork Showcase, please visit flyavl.com and click on Art + Music in the Social Hub to learn more. If you’ve flown much during the colder months, odds are you’ve been on a flight that had to be deiced before takeoff. Airplanes, especially jets, fly at very high altitudes and very fast speeds. At 35,000 feet, it’s not uncommon to see temperatures dip below negative sixty degrees Fahrenheit. If planes can operate in these extreme subzero temperatures regularly, why is it necessary to deice when on the ground? The reason for deicing lies within the design of the aircraft itself. All airplane designs are very precisely engineered to be flown as they were built, without the addition of any contamination. No, this doesn’t mean the aircraft can’t become ill with a virus. In aviation, the term contamination often refers to the buildup of ice on the aircraft’s wings and fuselage (the body of the aircraft). Even a small amount of ice on the wings changes the wing’s shape and impacts its aerodynamics. But fear not! As with everything in aviation, there are numerous precautions and procedures for all commercial flights to ensure safe operations in and around icing conditions. The process of deicing is relatively simple, but there’s a bit more to it than meets the eye. There are primarily two types of deicing fluid that are used in the United States. Both fluids are glycol based but have their differences. The first type, which is orange, is a true deicer. It’s the most diluted form of deicing fluid and is used to remove snow and ice from an aircraft. The other fluid is thicker and designed to stick to the aircraft for a defined period of time, making it more of an anti-ice fluid. Each fluid is applied hot, which is why you see so much steam when deicing in colder temperatures. Your pilot will tell the ground crew exactly what type of deicing fluid they need and where. In many conditions, they’ll just request deicing of the wings and tail. In conditions where there is no freezing precipitation, you’ll get a spray of of the deicer and be on your way. If it’s snowing, your flight will first get a coat of deicer, followed up with the anti-ice fluid. Based on the temperature and weather conditions, pilots know exactly how long they have to take off after being deiced. If they exceed this hold time, they must return to the gate to be deiced again. Additionally, pilots always visually inspect the wings before taking off in snowy conditions, regardless of how long ago the aircraft was deiced. During takeoff, the deicing fluid blows off the wings as the aircraft gains speed. Once airborne, aircraft are able to use their own anti-ice and deicing systems. Most jets use hot air from the core of the engine to heat metal surfaces along the edges of the wings to prevent and remove ice. That said, pilots and Air Traffic Control do all they can to avoid substantial icing conditions. It’s rare to ever spend a substantial amount of any given flight in icing conditions. At high altitudes, air is often so dry that there’s not enough moisture to generate any significant form of icing on the aircraft. Like all phases of flight, aircraft manufacturers, airlines and pilots have handling ice down to a science. Rest assured that if the winter weather is beyond the parameters for safe flight, your flight won’t leave the gate. If you’ve ever flown, then surely you’ve landed at an airport, proceeded to baggage claim, spent somewhere between five and ten minutes there and then begun to wonder when your bags will appear on the conveyor belt. “What’s taking them so long out there?” you’ve probably wondered. The job of the airline ground crews is seldom understood and often underestimated. While delivering your luggage quickly is a priority for all airlines, there are many things that must be done before the ground crew even get around to opening the cargo doors of your flight. The cumulative act of all things that must occur at the gate between a flight’s arrival and its next departure is known as a turn. The workers outside that handle this job are known as ramp agents, though the position has gained many nicknames over the decades. Most airlines require at least three workers be present to park an aircraft. This allows one person, the marshaller, to guide the plane to the proper parking spot while two other walk next to the wingtips of the plane as it pulls into the gate. Those that walk near the wingtips while you’re parking or pushing back are appropriately named wing-walkers. This three-person crew is usually the minimum staffing level for turning most single-aisle aircraft. The exact procedures vary depending on the type of aircraft being turned, but the general progression of events is similar for all. Once the aircraft has come to a stop at the gate, the ramp agents must wait for the engines to be turned off, and for the pilots to turn off the flashing red beacon lights. These lights are left on until the engines are no longer generating a dangerous amount of suction or jet blast. When these lights are turned off, the wheels of the aircraft will be “chocked” with large rubber chocks that prevent the aircraft from rolling while at the gate. Also after the beacon light is turned off, many airlines require the person that parked the aircraft to do a full walk-around of the plane, inspecting for anything abnormal. After the aircraft is chocked, the ramp agents will then connect the ground power unit (GPU) and pre-conditioned air (PCA) to the aircraft. Aircraft need to stay powered between flights so that things like cabin lights, air conditioning, and all of the cockpit computers continue to run. Most aircraft have an Auxiliary Power Unit (APU), which is a small jet engine near the tail that is used exclusively on the ground to provide power and air conditioning. This, however, does burn jet fuel. That’s why parked aircraft are connected to a GPU, which burns drastically less fuel than any of the aircraft’s own engines. If you’ve ever noticed the black cord running from the nose of your aircraft into a machine, that’s the ground power. The large yellow or orange hose, usually attached somewhere along the belly of your plane, is the PCA hose. Now that the aircraft is chocked, powered and air conditioned, it’s finally time to offload the bags. Keep in mind, your flight has probably been deplaning (allowing passengers to get off the plane) for three to five minutes at this point. Depending on the size of the plane, one or two ramp agents will get inside of the cargo bin to feed bags to the belt loaders outside. The remaining person will load those bags into the baggage carts. Only the smallest planes have one cargo bin, so if your flight is relatively full the crew will unload one bin at a time. If a flight has eighty bags and they unload one bag every four seconds (this is really cooking, by the way), that’s still a five-and-a-half-minute offload time. Once all the bags are off, they have to be driven to the location where bags are placed on a conveyor belt to baggage claim. This drive could be a distance of a few hundred yards (like at AVL) or several miles (like at ATL). Then, bags are offloaded one-by-one and often by one person. When you factor in the time it takes to move equipment into place, potentially unloading multiple cargo bins, and the fact that the average human is not an Olympic athlete, getting your luggage in less than twenty minutes is a very solid performance by the ramp crew (and “less than twenty minutes” is the norm at AVL – there are some hard-working ramp agents here!). Another important thing to consider is that this scenario doesn’t account for any adversity. There is a myriad of things that can slow the luggage offload process. Rain, snow, heat and even wind generally slow people down. Any oversized or overweight cargo will slow the baggage offload. The pilots may need to leave the engines running for an extra minute or two once parked, which will slow the entire process outside. Sometimes the ground crew may be short a person. If the ground crew takes a few extra minutes than you think they should, just remember all the steps that go into the turn and when your bag shows up on the carousel. You’ll know exactly how much hard work had to take place for you to be reunited with it. As day turns to night, an airport’s maze of painted markings and symbols transforms into a vast arrangement of backlit signs and colorful lights, each with their own distinct meaning. We thought we’d help you understand the night-time wayfinding that pilots use at airports around the globe. 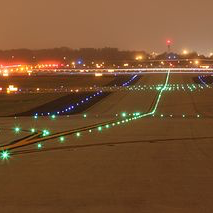 Taxiways – the “roadway system” that pilots use to get to the runways, are always bordered by blue lighting. Airports equipped with instrumentation to operate during dense fog also have green centerline lighting on their taxiways. Yellow lights give pilots a warning that there is an intersection, or a stopping point before they enter the runway. Runway markings can be some of the most complex to the untrained eye, but their lights are the most recognizable in all of aviation. 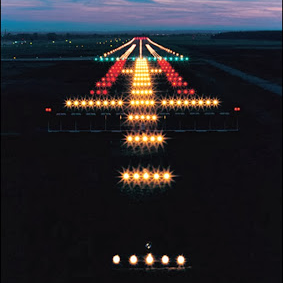 All runways have white lights along their edges, with green lights visible on the active end of the runway (since all arriving and departing flights travel the same direction on a runway) and red lights visible from the opposing end. As yet another visual aid to pilots, the last 2,000 feet of runway lights alternate white and yellow lights. Likewise, the last 2,000 feet of centerline lights alternate red and white, and the last 1,000 feet are all red. One of the most impressive lighting arrays can be found in the approach lighting systems, which serve as a visual extension of the runway for pilots and can extend as far as 2,400 feet from the runway. When using an instrument approach (where the pilots rely on instrumentation rather than the naked eye), pilots must see a visual reference of the runway before descending to a certain altitude in order to continue the landing. During low visibility landings, pilots will see the approach lights first, thereby allowing them to continue the landing. The next time you’re flying at night, take a closer look at the many different lights you see. Whether you know their meanings or are a casual observer, a good view of an airport’s lighting will never disappoint. (Asheville, N.C.) A parking garage construction project is underway at Asheville Regional Airport (AVL), which has resulted in temporary changes to parking at the airport. There is plenty of parking for passengers; however, the construction project has resulted in a temporarily reduced number of spaces for short-term parkers. In order to discourage overnight travelers from parking in its short-term parking lot, and to insure parking availability for short-term users, AVL is changing short-term parking lot rates. Specifically, the rate will remain at the current $1 for each half hour, up to four hours, to accommodate short-term users of the airport. After four hours in this lot, a new flat rate of $25 per day will be charged. This fee change goes into effect beginning November 1, 2016. Why the rate increase? Long-term, overnight parkers are using the short-term spaces, leaving limited parking for visitors who only need to be at the airport for a short period of time, such as those who are picking up a passenger, or conducting business at the airport. The fee change is intended to persuade long-term parkers to bypass the short-term lot and park in the long-term, pre-paid or credit card-only lots instead, where daily fees range from $6 to $8. This, in turn, will insure that spaces in the short-term lot will be available to users who only need to park for a short time. A new pre-paid, shuttled lot is located directly across the street from the main entrance. Travelers may opt to park in this lot, pre-pay $6 per day for the planned duration of their trip, and a shuttle will deliver them to and from the front door of the terminal. The shuttle is in operation around-the-clock. Also available to travelers is the traditional long-term lot near the terminal, and the credit card-only lot past the terminal on the right. Both of these lots are available for $1.50 per hour, up to a maximum of $8 per day. And for those picking up passengers, a great option is to use a convenient cell phone waiting lot located past the terminal on the right. There is no charge to park in this lot, but visitors must wait in their vehicles until their passengers arrive, and then exit the lot and drive to the terminal curb to pick up passengers. The new fee structure for the short-term lot is temporary, and will be in effect until the new parking garage opens next year. When opened, the garage will offer 1,100 convenient parking spaces directly in front of the airport terminal to serve all customers’ needs. Handicapped parking is still located in the short-term lot, directly in front of the terminal. The fee for handicapped parking has not changed (long-term rate of $1.50 per hour, up to a maximum of $8 per day). Visit the airport's parking information here.